So if you are looking for a backup solution for your Office 365 subscription; this is one of these online services that I can highly recommend. One more reason for me to share what it has to offer. I will also tell you how to get it, since this service is only available through Microsoft Partners. With SkyKick Migration Suites you can automate migrations to Office 365. You can migrate from Exchange On-premise, Google, IMAP, POP3 and more. And you can also migrate from Office 365 to Office 365, is what they call O2O. With SkyKick Cloud Manager you can manage cloud customers from multiple SaaS providers more efficiently. You can even manage Office 365 with it. I am not going to cover those two since this blog is about the SkyKick Cloud Backup service. With SkyKick Azure Storage your backup data is stored on an Azure Storage Account owned by SkyKick. You can select in which region you want to store it. There will be no extra charge, and as mentioned there is no retention- or data store limit. Of course the data is encrypted and never leaves the Microsoft datacenter. If you want to have more control over your backup data you have the option to use your own Azure Storage Account by providing an storage account name and access key. By using your own Storage Account you can also keep the data when you stop using SkyKick Cloud Backup. But note that you will be charged extra for your own Storage Account. It does not give you a discount on the licenses needed for SkyKick Cloud Backup. NOTE: Please note that you cannot change this afterwards. If you want to switch between a Storage Account, you have to disable the current subscription, and start a new subscription. For each seat you pay a monthly license. So for instance, if you want to backup an Exchange mailbox and OneDrive for Business for a single user, you have to buy two seats. And if you want to backup an entire SharePoint Site Collection, you need one seat. I will get back to the seat pricing in the Microsoft Partner section. 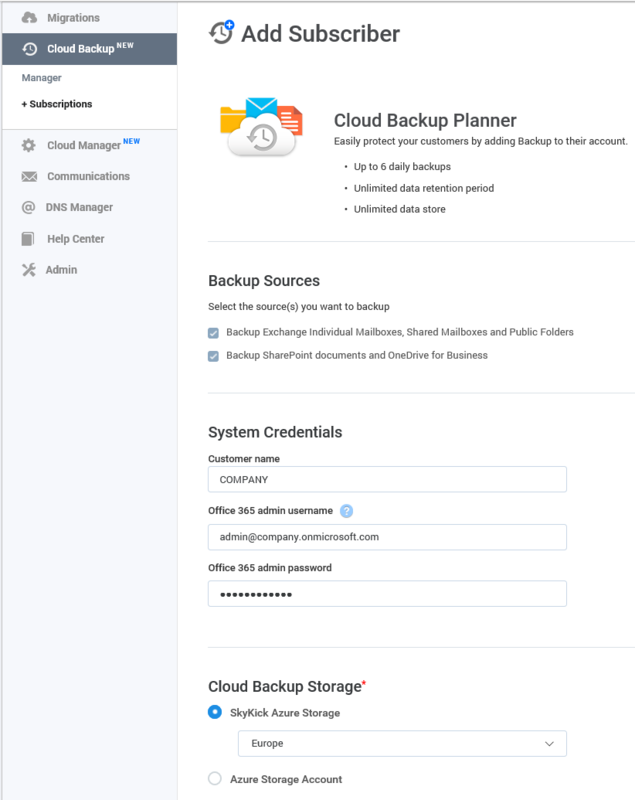 The really cool thing about SkyKick Cloud Backup is that it is very easy to configure. You can select which mailbox, OneDrive or SharePoint Site Collection you want to backup. When you add a new mailbox at a later time, SkyKick gives you the option to automatically add the new mailbox to your backup policy. Or if you want, you can just get a notification or do nothing at all. Restoring is also easy. Just select the mailbox and click restore. Or you can search for an item or file and click restore. At the time of writing you can only restore to the original source. You cannot restore to an alternative location. SkyKick Cloud Backup is only available through a Microsoft Partner. With other words, customers cannot get their hands on a SkyKick account. So as a customer you have to select a partner and ask them to create a subscription on SkyKick. The partner configures the subscription on SkyKick and when needed the customer has to request a restore. SkyKick Cloud Backup works very good. Personally I think this service has real value if you are looking for backup solution for Office 365. The setup is easy and the restore couldn’t be easier. SkyKick is a partnership with Microsoft and they continue to improve their online services. I hope this information was informative to you. Feel free to leave a comment. Thanks Boudewijn for the post. Very helpful. I have a follow up question. Consider I have 10000 users with E3 license and each user have 3GB mailbox in EXO and 5GB in OD4B. The SPO site collections is around 1TB. Am wondering How much time would it take for initial sync of the content for these 10000 user data if I go with Skykick. What was your experience during the POC. Good question. Unfortunately I cannot answer that question for sure. One thing I do know; since it is a partnership with Microsoft Azure, the data does not leave the Azure datacenter, traffic is passed through their private network. I have configured +/- 150 mailboxes (including their OneDrive) and about 21 site collections. Once I configured the initial sync, checked it the next day and it was finished. I advise you to call SkyKick Support. I have called them three times before I even started a subscription and they were very helpful (and professional) to answer all my questions. I am certain they can answer your question. Hi, another efficient Office 365 backup tool available online is SysTools Office 365 Backup software. Excellent post, thanks so much. SkyKick Backup is a partner-only tool. (Microsoft) Partners are SkyKick’s customers, and partners will enter customer tenants in the SkyKick portal. To do so, a tenant is entered into the SkyKick portal by entering Admin-level credentials. Not only Admin-level, the account has to be a Global Admin, and in turn: SkyKick Backup will create extra Global Admins in the tenant. In other words, it seems like you’re giving the keys to the kingdom (in fact, the kingdom is your customer’s environment) away to a third party platform. And this platform, does not even offer basic security measures like MFA or SSO. The solution itself looks excellent, I am really excited about that. Also the ease of use when setting it all up, it is so good. Even the Security page that SkyKick have set up mentions a lot of useful information. But, I just have the feeling that some basic security is missing here. Thank you! You are certainly not paranoid. It is always good to challenge such security concerns. I was even had the same question. Right now it all comes down to trust. But to have the corrects answers I would recommend to contact SkyKick support, even when you don’t have a subscription yet. Another side note; with SkyKick Backup you cannot restore to another destination. A partner who made the subscription can only restore to the same Office 365 subscription. This does not fix the Global Admin requirements, but safeguards it somewhat when multiple administrators (from the partner) might have delegated permission on your subscription. You say “it all comes down to trust”. This amazes me, to be honest. How can you “trust” that your SkyKick portal does not get hacked? As long as the only protection is username+password it can be hacked, I would say. And then, information about customers might be exposed… Maybe not access to subscriptions or credentials (because credentials are stored in encrypted format), but I keep on insisting that an extra layer of security to access the portal should be implemented. I fully agree with you. I also prefer to have an extra layer of security. It would be nice to have an (one-time) application password for this kind of service. I am planning to investigate if that is possible. Not sure if I am able to provide a solution. But if I find one I will post it here. According to skykick support you cant bulk restore your site files in case they get corrupted. You have to manually restore file by file. That is extremly time consunsuming. Microsoft already has previous versions enabled for onedrive and sharepoint, so I don´t understand the need for skykick? Try also the office 365 backup tool and easily Backs up Office 365 mailboxes in PST files. Backs up Office 365 mailboxes in PST files & restores when needed. Allows to backup of single & multiple Office 365 mailboxes. Backs up multiple Office 365 mailboxes using a CSV file. Filters Office 365 mailbox data before backing up. Allows excluding Deleted folder and empty folders from backup. Restore/imports PST files to Office 365 mailboxes when needed. Saves log report in CSV format after backup/restore. Suitable for non-technical users because of easy to use interface.